The third and last case study in this three-part series related to breaking borders is an interview with Carter Strickland, the New York State director of the Trust for Public Land (TPL), regarding the TPL’s Schoolyard to Playground Program. The previous interview was with Deborah Marton of the New York Restoration Project. The Architect’s Newspaper: Can you give me some background on the Trust for Public Land Schoolyards program and how it breaks down borders? Carter Strickland: Since 1996, the Trust for Public Land (TPL), has been working out of its New York City office to partner with the City of New York and its Department of Education, to transform low-performing asphalt “play yards” into multi-benefit play spaces used by the schools during the school day and the local community after school, on weekends, and on holidays and vacations—including all summer. Our work breaks down the physical border between schools and the surrounding community by unlocking fences and opening a new neighborhood park and breaks down institutional and other borders by involving the community in the visioning and design process before the park is built, and in the programming and use of the park after it is built. AN: How do you choose where to work? CS: Over the last 20 years, TPL has worked with the city to identify asphalt schoolyards that offer little in play value—mostly barren, uninspiring asphalt yards that have no play equipment except for rundown basketball courts, that shed water from their impervious surfaces to the storm sewers and retain pools of water days after rainstorms, and, because they are black asphalt and absorb the sun’s rays, are increasing the urban heat island effect. These areas are surrounded by high wire mesh fences; they have all the charm of a prison yard. Worse, they were historically locked up, only used by the school, and not available to poor communities starved for open space. We look for principals, teachers, and custodians who are ready and willing to invite the community in. AN: How has the program grown? CS: That model was pursued on a small scale initially dependent on corporate funding, with 12 sites built in the first eight years. By 2004, the city had obtained mayoral control of the school system and was open to public-private partnerships, and TPL was able to formalize its partnership in an MOU with the NYC Department of Education and the NYC School Construction Authority to renovate schoolyards. The agreement provided 2 to 1 matching funds from the City of New York for the development of five playgrounds a year for five years, a pace maintained from 2004 to 2007. Former mayor Michael R. Bloomberg launched PlaNYC, a comprehensive sustainability plan for the city that adopted a goal of having every New Yorker live within a 10-minute walk of a park. To meet this goal the city encouraged creative approaches and especially cross-silo efforts, and the program really took off. The city entered into a partnership with TPL, which would serve as the community engagement intermediary with schools and neighbors, the Department of Education (which Mayor Bloomberg got control of from the State of New York), and the Department of Parks & Recreation, which designed and built the playground transformations, and approximately 150 more part-time schoolyards were transformed into full-time community playgrounds between 2007 and 2013. 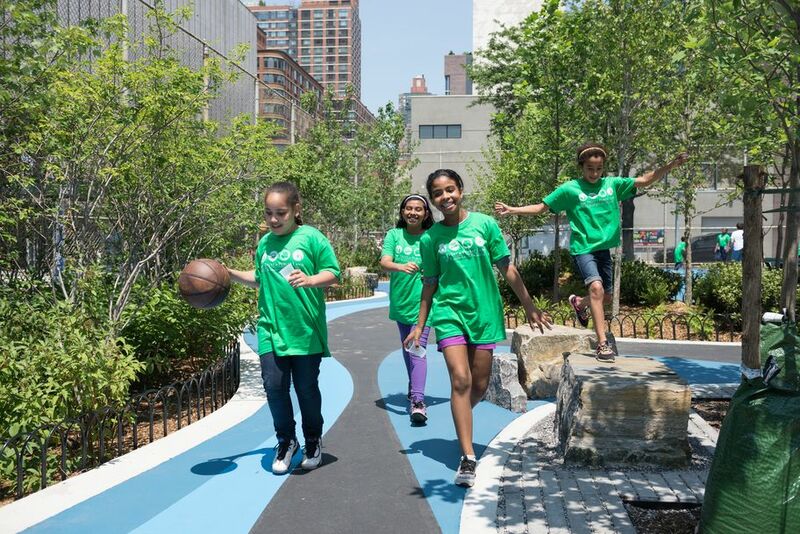 The PlaNYC work wrapped up but NYC Department of Environmental Protection stepped up as a funder for parks that absorb water to meet the goals of the NYC Green Infrastructure Plan, and many councilmembers and borough presidents sought to fund these mini-parks for the benefits of their communities. Recently, New York State has funded playgrounds in central Brooklyn as part of its comprehensive Vital Brooklyn health initiative. To date, TPL has worked with the city and various funders to build 197 green playgrounds, with 15 more in various stages of design and construction. AN: What are the environmental benefits of the initiative? CS: Since 2013, TPL has designed playgrounds to include green infrastructure elements such as rain gardens and absorbent turf fields, turning each of the spaces into a stormwater capture system. This has helped the city to meet its legal mandate to reduce stormwater runoff going onto the Combined Sewer System (CSS) in NYC that contributes to Combined Sewer Overflows (CSOs) during rainstorms, a significant source of pollution to the nearby rivers and harbor waters. AN: Can you explain the design process? CS: TPL and its consultant landscape architects work with students, teachers, and neighbors to design a new, full-service playground for the school’s use, with new play equipment, sports fields with synthetic turf (it was determined that real grass would not survive even one week of intense use), a running track, performance areas, trees, and gardens with both flowers and places to grow vegetables. We spend five-to-ten weeks in the schools and community, with schoolchildren measuring the grounds, undertaking a sun/shade analysis, surveying the community for a recreational needs analysis, and learning about budget and other constraints. Our professionals turn this data and vision into alternative designs, which are then voted on by the school community. In this way, we transform not only public spaces but empower the community and students with knowledge and the experience of improving their neighborhood. AN: How is TPL using New York City as a prototype for work across the country? CS: The TPL Schoolyard to Playground model has been replicated in other cities in the US, including in Philadelphia, where it works with the very progressive Philadelphia water department in creating “water-smart” playground in both parks and at schools, as well as in Newark, New Jersey, and in San Francisco and Los Angeles. Use of vacant lots for parks and community gardens is not a new idea. A March 28, 1896, article in Scientific American article titled “Cultivation of Vacant Lots by the Poor,” described prototypical gardens on New York City vacant lots intended to be a prototype for cities across the country. While the focus was on food production the social value cannot be discounted. An important difference between this work and that of the three leaders interviewed is an attitude that works across demographics and socioeconomic borders. They are opening up space and expanding attitudes about how we treat one another. This progressive move away from the anti-planning that Commissioner Silver described to an open and inclusive process is helping us move beyond postwar attitudes that created so many urban ills. Every organization is buttressed by new data, analysis, and design tools to make more public space available in the growing city. Parks Without Borders has very meaningful perceived and real physical impacts. To the extent that that streets, sidewalks, neighborhoods, and parks become more fluidly connected to the city, quality of life in neighborhoods across the five boroughs will improve. The work of NYRP in developing vacant lots and underused NYCHA property for community gardens has had a transformative impact on the social and economic well-being of underserved communities. At Trust for Public Land, opening up schoolyards has direct benefits on local neighborhoods, and engagement of kids, teachers, and principals in a design process that involves both form-making and environmental considerations will have a long-lasting impact on the people involved in the development process. The city of the future is evolving as a greener connected polis thanks to the efforts of these and other visionary leaders. Borders are opening on the city level as political rhetoric nationally suggests a grim alternative.